The first of two weeks of NXT with Takeover quality main events, kicked off with American Alpha challenging The Revival for the Tag Team Championships in a Two out of Three Falls match. It's been noted that I'm a big mark for Two out of Three Falls contests, so could Chad Gable, Jason Jordan, Dash Wilder and Scott Dawson, live up to my expectations? The Revival retaining their Tag Team Championships, coming from behind to win their Two out of Three Falls match with American Alpha, 2-1, was a superb main event, being a real example of what tag team wrestling can be when given the time and effort. What I enjoyed most about the contest was that the original fall felt like a regular match between the two teams. There was no flash pinfall early on or another gimmick that's been used time and time again in these types of matches, the contest just played out like a regular tag team match. The pacing of this first portion saw both teams jostling for control, with a American Alpha once again receiving an extended face shine, which played nicely into The Revival's period of control. This was the match that had me completely sold on The Revival as a duo. That isn't to say that I hadn't enjoyed the team previously, but this was the clash that made me see Dash Wilder and Scott Dawson as a special tag team. The pair worked so well together throughout the fight, cutting the ring and initially focusing on Jordan's leg (which would come back later in the match), before using every trick in the book to keep Gable in their corner. Both guys attitudes makes them easy to get wound up by, as they give very little away and go about their business in a fairly nonchalant manner, whilst at the same time making sure that whoever is waiting for the hot tag can up their game and get the crowd behind them. It's helped by the fact that pretty much everything The Revival do in the ring is crisp and tightly done, with very little wasted movement. The final stretch of the bout featured a lot of ideas that had been seen earlier in the contest, as well as all three falls. Everything revolved around Jordan's hot tag, as while a tremendous sequence of action would see Wilder tap to an Ankle Lock, it was Jordan's previously injured leg that would lead to him tapping to an Inverted Figure 4. Corey Graves did a world class job on commentary keep that story ticking over, although I wish Jordan had sold his injury a little bit more on his comeback. Lots of false finishes, Gable having to save Jordan from another Inverted Figure 4 and both teams just dodging their opponents double team finisher kept building the match's excitement levels as the crowd was whipped into a frenzy by the time The Revival nailed a Shatter Machine onto the apron on Gable for the win. The first must-see match on regular NXT TV for quite some time. The other notable match on the card was Bayley's victory over Alexa Bliss in a quality opener. A great piece of booking here, as after Bliss' victory over Carmella last week, this felt like the logical step up as the brand looks for a Number 1 Contender to Asuka's Women's Championship. The two character slotted together nicely, with both bringing something different to their game here. Bliss looked comfortable wrestling with the more accomplished Bayley, managing to keep up with the former Women's Champion, whilst Bayley unleashed a fiery comeback that showed her character frustration well. My only real complaint with the action was that Bliss wasn't going for her Twisted Bliss finisher when Bayley got her knees up to block en route to hitting Bayley to Belly, as this would have upped the drama of the contest. After the match, Bayley appeared to challenge Nia Jaxx to a future re-match. Elsewhere, Rhyno made his return to NXT as he interrupted a tag match between The Hype Bros and Blake & Murphy (yeah, they're back as a team, apparently) by managing to Gore three out of the four competitors. 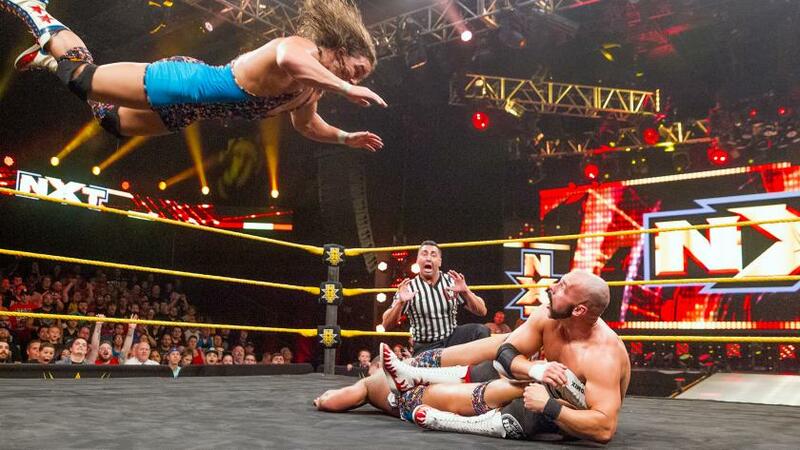 The Two out of Three Falls match taking up a large portion of the show means that this week's NXT scores just under a "Superb" rating on the ATPW Scale. That's an amazing rating for a television show. This was indeed a great outing for the brand, with the main event being complemented by a strong women's opener between Bayley & Alexa Bliss. This is arguably the best edition of the show since Samoa Joe and Sami Zayn's Two out of Three Falls match took up the entire hour. With Finn Balor v Shinsuke Nakamura coming up next week, it looks like the good times may continue to roll for the yellow brand.